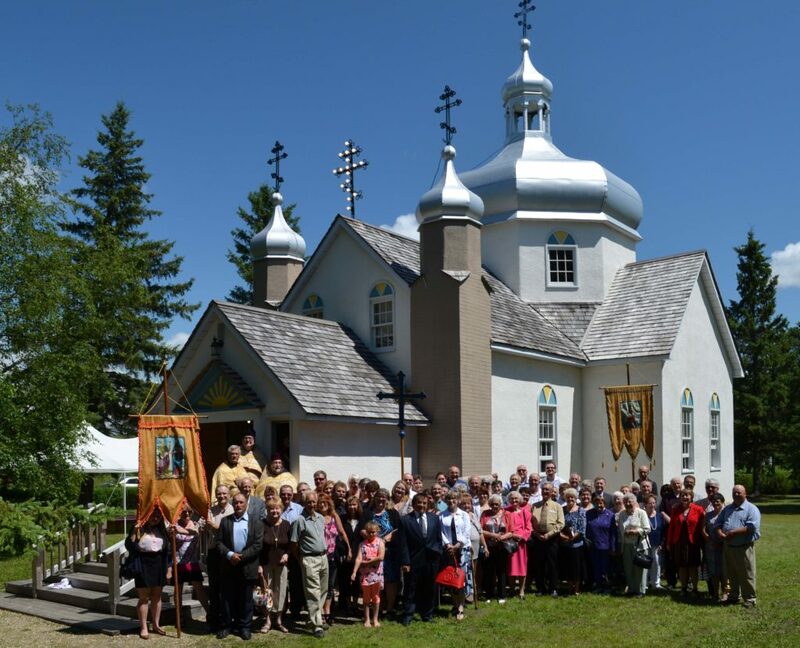 On July 17, 2016, the St. Peter & St. Paul Ukrainian Orthodox Church in Sundown celebrated its 75th Anniversary and Patron Saints’ Day with over 130 people in attendance from near and far. The day began with a Divine Liturgy celebrated by Very Reverend Archpriest Taras Udod with Very Reverend Miron Pozniak, Parish Priest and Reverend Roman Bozyk, Dean, St. Andrew’s College. Clergy and guests were greeted with a traditional Ukrainian welcome of Kolach and salt presented by Laura Eliuk and Heidi Bjornson with Maëlle Green carrying a clutch of wheat. Father Udod, representing His Eminence Metropolitan Yurij, welcomed the guests. He presented a moving and relevant sermon touching on the importance of God in the lives of the early pioneers and our continued need for strong links with God and the Church today. He stressed the legacy left by our ancestors, and that their values were reflected in the members today. He congratulated the parishioners on their continued efforts to ensure the health of the Church. Choral responses were led by our Parish Cantor, Martin Chobotar, with a group of talented singers who lent their voices to this special day. Following the service, the congregation moved outdoors for the Blessing of the Water service and the blessing of the Church. The interior of the Church, bathed in sunlight, looked magnificent on this day – reflecting the extensive restoration and preservation work, and finishing touches such as new cross-stitched rushnyky and floral arrangements. On the wall in the recently renovated vestibule of the Church, a collage of archival photographs was assembled and mounted by Phil Wiwchar and will form a permanent display in the Church. The manicured church yard, extensive exterior church improvements, tent with seating, newly painted cross and floral adornments showed careful attention to detail and readiness for the event. Guests moved to the Sundown Community Hall following the service to enjoy a wonderful traditional Ukrainian dinner, complete with borscht, fried chicken, holuptsi, pyrohy, meatballs, carrots, coleslaw, buns and dessert. The tables were beautifully laid out and each guest received a pamphlet with a brief history of the Church and pictures (view pdf here). Rev. Father Miron Pozniak led the opening prayers. Rev. Father Taras Udod reiterated the day was one of profound expression of gratitude to God for his many blessings, and especially for guiding previous generations to provide the example of faith that has been handed down to the present members, supporters, friends and visitors who gathered for the day. Janet Bjornson, President of the Sundown Church, stressed that our goal for the celebration was to honour and celebrate the contribution of our ancestors, and the rich and lasting legacy they left us. She provided a brief history of the Church and thanked those who provided financial and other support for its restoration. We were especially pleased to have the Honourable Rochelle Squires in attendance, the Manitoba Minister of Sport, Culture and Heritage. She congratulated our members on their commitment to their culture and heritage and their efforts in restoration and preservation of the Church. She spoke of the government’s commitment to heritage tourism and of her pleasure in attending and getting to better know our corner of the province. Cliff Graydon, MLA for Emerson, presented the congregation with a glass ornament with the profile of the Sundown Orthodox Church on behalf of Dennis Smook, MLA for Provencher. He also presented a Certificate to us on behalf of his constituents and another on behalf of Ted Falk, MP for Provencher. Alex Bachinsky, President of Vita District Parish, reminisced of the early days of church life, with references from articles in the Carillon News. Angela Smook-Marusak, Director, Communications and Programs, Manitoba East European Heritage Society, spoke of the immigration of the early Ukrainian pioneers to Southeastern Manitoba, and of their hardships and perseverance. 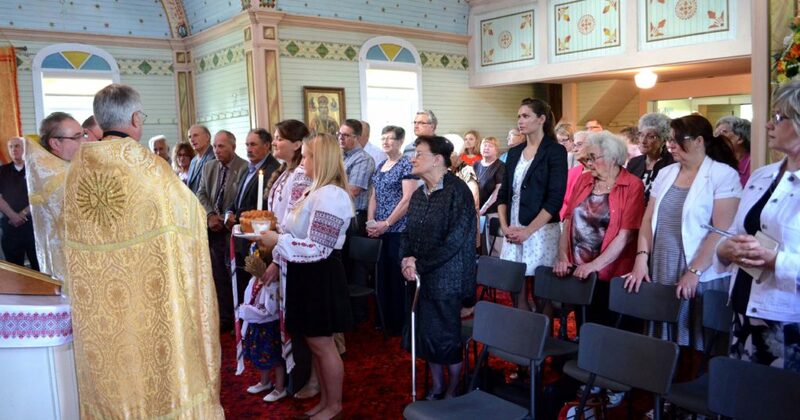 She informed everyone of the celebration of the 125th anniversary of Ukrainians to Canada in 2016 and 2017 and special events associated with this milestone. 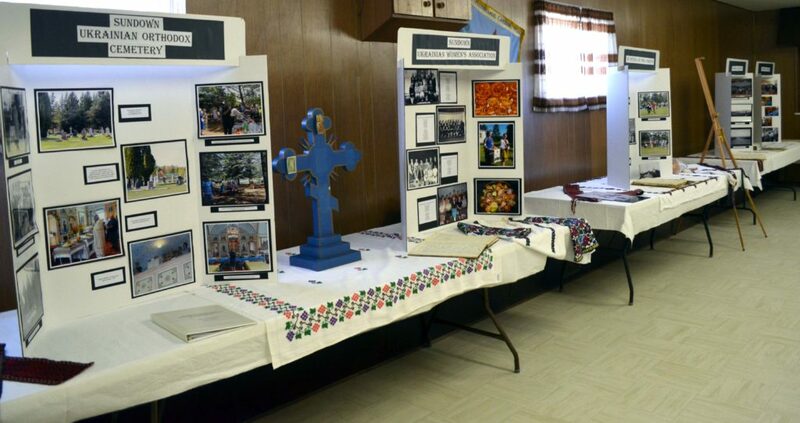 Other display items included Ukrainian shirts and sashes brought from Ukraine by immigrants in the late 1800s, record books of the Church, Hall, and the Sundown Ukrainian Women’s Association from the 1940s, and a record of members of the Church from 1939 to the present day. Following the program and dinner, many guests chose to stay on and visit with friends and relatives, view the display and reminisce of earlier days and life in Sundown. Our sincere thanks go out to all who came to celebrate this special day with us. A special thank you to our members for their hard work, perseverance and dedication in preparing for this day.